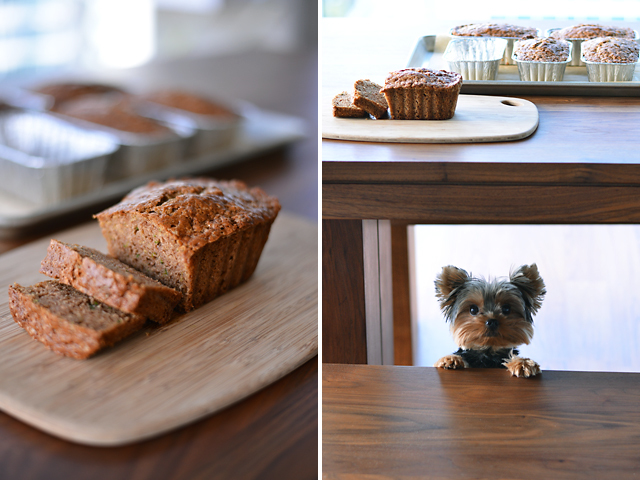 I don’t really want Cooper to overshadow the zucchini bread in this post, but it is his first blog appearance, so I’ll let you be the judge. Before I start gushing about the joys of puppy parenting, let me tell you that this zucchini bread is really good. This version has a little whole wheat flour, sour cream, raw turbinado sugar, and a good dose of cinnamon and freshly grated nutmeg. It’s the kind of treat that is perfect sliced and toasted with a cup of tea for breakfast or on its own as an afternoon snack. In the middle of taking pictures for this post, I noticed Cooper’s little face staring at me from under the kitchen table, peaking over one of the benches (which we have in lieu of chairs). He usually hangs out in his crate when I’m working on a blog post, but I guess I didn’t latch the door all the way. And true to his attention-loving personality, he insisted on getting his picture taken. Riley, our older dog, will turn his head any time you point a camera at him, but not Cooper. He loves the spotlight. Cooper is the crazy one in our little 2 human, 2 dog family and he is constantly getting into trouble. Leave a bathroom door open and you will find all the toilet paper unrolled and ripped to shreds in a pile on the floor. Buy an amazing antique cabinet, look away for 2 seconds, and there will be tiny puppy teeth marks somewhere on it. He is technically still a puppy (not even 2 years old yet), so we’re waiting for the day when he calms down, but I’m secretly hoping that not all of his craziness goes away. His antics keep me on my toes and I love that about him. Even though Riley is a little more camera shy than Cooper, he is usually sitting on my lap as I write these posts—a good little blogging assistant. I’m sure at some point he too will make an appearance, but for now you’ll just have to enjoy Cooper and this delicious zucchini bread. I like baking this zucchini bread in mini loaf pans (I use disposable foil ones), which cuts down the baking time, creates cuter/well-portioned loaves, and makes clean up a breeze. If you prefer, you can bake this recipe in 1 standard loaf pan instead, just adjust the baking time accordingly. Preheat the oven to 350 degrees and lightly brush 5 mini loaf pans with a little oil. In a large bowl, whisk together the all-purpose flour, whole wheat flour, turbinado sugar, baking soda, cinnamon, nutmeg, and salt. In another bowl, whisk together the eggs, oil, sour cream, and water. 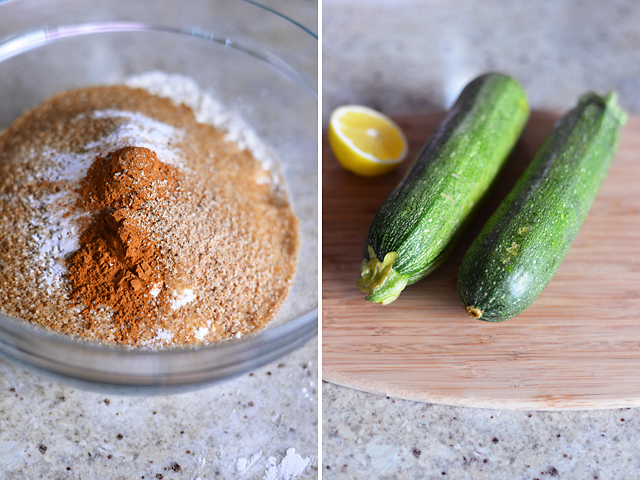 Squeeze the lemon over the grated zucchini, and then stir the zucchini into the egg-mixture. Add the wet ingredients into the bowl with the dry ingredients and stir until there are no more dry patches in the batter. Divide the batter among the 5 mini loaf pans, place them on a rimmed baking sheet, and bake for about 45 minutes, until a tester inserted in the center of one of them comes out clean. Cool completely and wrap tightly in plastic wrap to store. I love the light and colors in your photographs. They’re beautiful and Cooper’s so cute! He is TOO CUTE! And this bread looks lovely. I been making so many different dishes with courgettes (zucchini) this summer but have yet to try a bread – yum! Thanks! His sweet little face makes up for all the trouble he causes :) We’ve been eating a lot of zucchini this summer too and making this bread is a great way to use some of it up! Beautiful pictures.The Bread looks very delicious. I have to try! I just love zucchini bread, it looks yum! OMG! cooper is an angel! so precious i could eat him. but what i really want to eat is that zucchini bread. brilliant job! This was comparable to sending out a Christmas card with only one child on it……and just the way sibling rivalry gets started! lol. I expect to see a picture of my OTHER grand-puppy Riley on your very next post. Would love to be sharing a piece of that zucchini bread and some tea with YOU today. Don’t worry! RIley will get his chance in the spotlight :) Love and miss you too! OMG! How cute is COOPER!?! I love the 2 human, 2 pooch household club – it’s the best club ever. 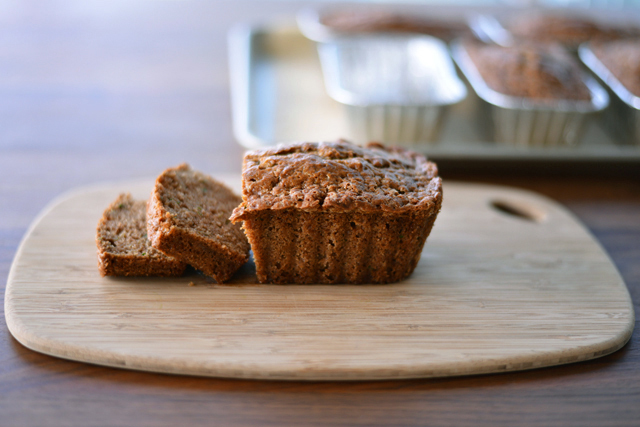 Oh yeah… let’s not forget about the zucchini bread. It looks extremely moist and flavourful. I’ve yet to try a zucchini bread but might have to retify that soon. Copper is too cute! He is so adorable that he almost looks fake, like a stuffed toy! :-) Your photos are lovely.